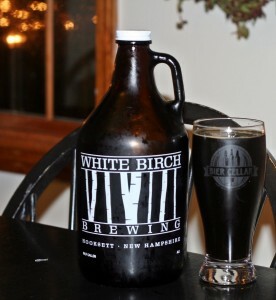 After finishing (drain pouring) the remainder of my Sea Dog growler I moved on to a growler from White Birch of a similar but much better beer. Tavern Ale has an interesting story (read brewer description below) and is brewed as an Imperial Brown with plenty of smoked flavors. The beer pours almost black with no head. Aroma is subtle but pleasant with smokey malts and maybe some dark fruits. Taste follows the nose with a mild smokey flavor and slight bitterness. Beer is easy to drink and masks the alcohol well. Overall this beer was very enjoyable and at 8% ABV it is a little sneaky. Brewers Description: Butter’s Tavern was a fixture of Concord, NH in the eighteenth century. Inspired by their loggerhead ale, we’ve created a Smoked Imperial Brown Ale. Hearty malts, with a nuanced smokiness and smooth finish create our interpretation of this historic ale. We hope you enjoy this slice of New Hampshire history. In November of 2011 we were proud to learned that Draft Magazine recognized our Tavern Ale as one of the Top 25 beers of 2011!